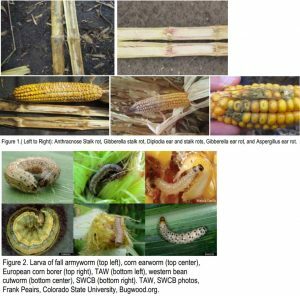 Insect, disease, and environmental stress during grain fill can compromise corn yield potential and quality. Monitoring the crop can help guide decision making during grain fill and provide insight for managing the harvested crop and planning for next season. Late season stress can reduce the plant's photosynthetic capacity. Remobilization of carbohydrates from stalks and leaves occurs in order to feed developing kernels. As a result, this may weaken the plant structure and overall health at the same time.